This recipe, originally inspired by a recipe of one of my favorite blogs, Smitten Kitchen, is an amped-up version of the grain salad posted in the most recent CSA newsletter. The recipe requires a fair amount of chopping work up front, but your hard work will pay off in the end. Your reward? A huge bowl of pleasantly chewy barley (if you have never cooked with barley before, you are in for a treat) and tender cubes of eggplant and zucchini, punctuated by juicy sweet tomatoes, the bite of paper-thin slices of raw red onion, and a sprinkle of chopped capers. The whole delicious mess is bound together by a simple lemon vinaigrette and a healthy dose of fresh parsley and mint. We ate this topped with a bit of feta cheese as a hearty vegetarian meal, and it lasted us through two dinners and one day of packed lunches. You could certainly serve it as a a side dish with some grilled chicken, fish, or lamb. You can also make this ahead of time and serve at room temperature for the ideal picnic take-along! 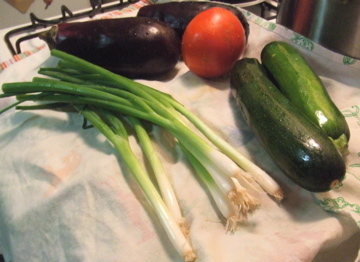 Put oven racks in upper and lower thirds of oven and preheat oven to 425°F for eggplant and zucchini. While oven preheats, begin cooking barley: Heat 2 tablespoons oil in a 3- to 4-quart heavy pot over moderately high heat until hot but not smoking, then cook scallion, cumin, coriander, and cayenne, stirring, until fragrant, about 1 minute. Add barley and cook, stirring until well coated with oil, 2 minutes more. Add broth and water and bring to a boil. Reduce heat and simmer, covered, about 30 to 40 minutes. While barley simmers, roast eggplant and zucchini. Toss eggplant and zucchini with 5 tablespoons oil, 3/4 teaspoon salt, and 3/4 teaspoon pepper in a bowl, then spread in 2 oiled large shallow (1-inch-deep) baking pans. Roast vegetables in oven, stirring occasionally and switching position of pans halfway through baking, until vegetables are golden brown and tender, 20 to 25 minutes total. 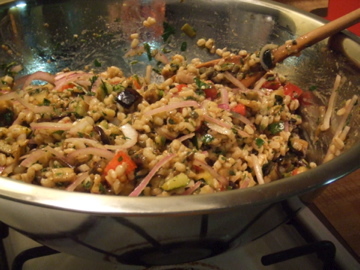 Combine vegetables in 1 pan and cool, reserving other pan for cooling barley. Cool barley: When all of liquid in barley pot is absorbed and barley is tender, remove from heat and let stand, covered, 5 minutes. Transfer to reserved shallow baking pan and spread to quickly cool, uncovered, to room temperature, about 20 minutes. While barley and roasted vegetables cool, make dressing and assemble salad: Whisk together lemon juice, garlic, sugar, and remaining 1/4 teaspoon salt, 1/4 teaspoon pepper, and 3 tablespoons oil in a large bowl. Add barley, roasted vegetables, and remaining ingredients to bowl with dressing and toss until combined well. Serve topped with crumbled feta cheese (optional).